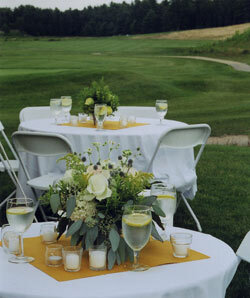 All wedding packages at Southers Marsh come with a minimum of 2 passed appetizers and 1 stationary appertizer. We feel that a great cocktail hour sets the tone for the entire evening and that presentaion is just as important as the food quality itself. We want your guests to know in the first three minutes they are at Southers Marsh that they are going to have a great night. Some of the appetizers we are best known for are our coconut shrimp tempura, proscuitto wrapped asparagus, and a raw bar featuring locallly harvested Island Creek Oysters. For different tastes and budgets, we offer three distinct wedding packages. All are served with the same high quality ingredients and the same exacting attention to detail. Our menu includes a variety of chicken, seafood, and beef options, but if you don't see specifically what you have in mind, we would love to work with you to create your dream menu. Substitutions can be made for vegetarians and children. We offer several beverage service options to ensure that your guests enjoy themselves - cash bar, limited open bar, or open bar. We can also provide up to three different passed cocktails during cocktail hour, so your guests are free to enjoy themselves rather than spend time waiting in line. One example of this would be a flute of champagne, cosmopolitan garnished with cranberries, and a chilled glass of Harpoon IPA.